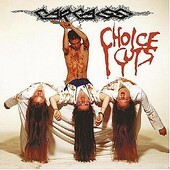 Arguably the most influential extreme metal band, the mighty Carcass have finally released its long awaited greatest hits package, wryly titled Choice Cuts. Containing 21 tracks by the progenitors of pummeling metal, this collection spans the outfit's career from its gory and grinding beginnings until the band's demise, from which its best and most influential work comes. If you're looking for a crash course in extreme metal, this CD is essential, especially for the previously unreleased Peel session recordings.